A 7.0 magnitude earthquake rattled Anchorage at 8:30 a.m. on Nov. 30. 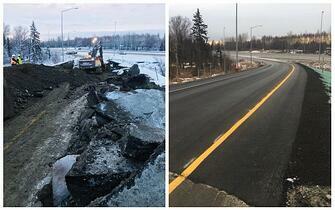 Shortly after Alaskans were back to their routine in part due to how quickly Knik Construction mobilized to fix the many roads that collapsed – especially the section of highway that carries traffic from the Kenai Peninsula and Anchorage to the Anchorage airport. Within an hour of the quake, Knik President Dan Hall placed a call to the Alaska Department of Transportation (AKDOT) offering to assist in the repair of eight breaks in essential travel that were deemed highest priority for transportation. "Within two hours of getting the go-ahead to start work on the northbound Minnesota Highway Exit at International Airport Road and a small stretch of road in the Soldotna area, Knik employees were ready to go to work," Dan explains. Just 72 hours after the earthquake and despite 4.0 aftershocks, Knik crews repaired the collapsed highway, paved it, striped it and opened it to the traveling public. "Knik’s ability to react in this timely and professional manner is a testament to the people that we employ. The credit goes to our team that jumped in to help," Dan says. Paving in the winter isn’t ideal, but if done quickly, heat can be retained in the asphalt mix to allow for proper compaction and to give the surface treatment a chance for long-term success. "Knik crews worked alongside our subcontractor McKenna Brothers in the paving process and completed a very successful project," Dan says. "As always, Lynden people have responded professionally and proactively and, once again, they make us all proud," says Chairman Jim Jansen. The quick response and excellent repair work drew national attention from CNN, USA Today and AP News and went ‘viral’ online. The before and after pictures became an internet sensation and sparked questions about their authenticity. The story was so unbelievable, that even the online urban legend site Snopes had to fact check it. The story was also used as an example of Alaskans’ resilience in the face of Mother Nature and as a blueprint for other states to get highway projects done quickly by working together with multiple agencies. Lynden offices weathered the 1964 Alaska earthquake and faced the Nov. 30 incident with the same can-do attitude. Jim Jansen shared the following from that day. "The wild ride that morning resulted in most of our employees going home to check on their families and homes. With road closures, parents getting kids from schools and people trying to get home, it was a traffic mess," he says. "By noon the airport was open and most of our people got to their homes and found the damage was cosmetic with fallen ceiling tiles, tables and pictures on the floor and broken glass. Some had water lines leaking and a few gas leaks. By afternoon, Anchorage businesses, including Lynden, began to function and the emotion and fear subsided." The Lynden facilities, including marine facilities in Anchorage, Kenai, Whittier, Cordova and Valdez, all fared well and were structurally operational. Knik is continuing its AKDOT work into the new year to repair highway road failures in Anchorage and the Kenai Peninsula. Knik Construction received letters and drawings from the kindergarten class of Campbell STEM Elementary in Anchorage for the quick repair of essential roads. Each student wrote a thank you and created construction-related artwork. The notes were presented to Knik as part of the school’s Day of Caring.